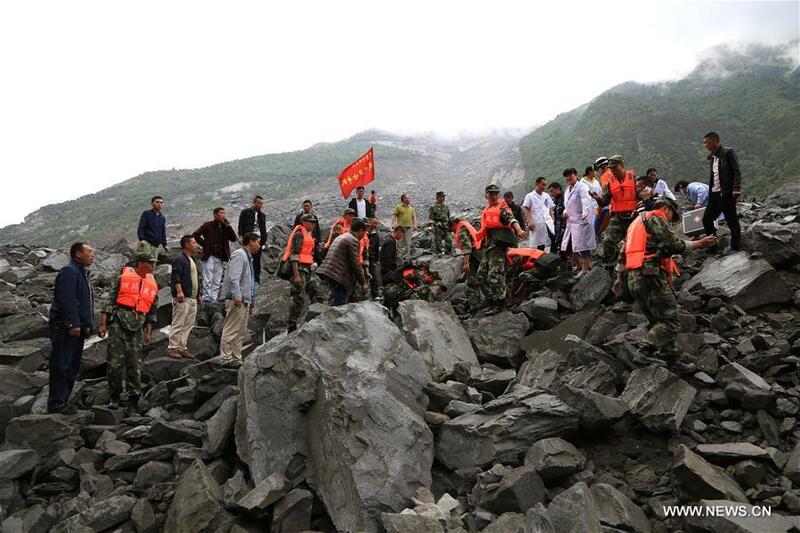 CHENGDU, June 24 (Xinhua) -- Six people have been confirmed dead in a landslide in southwest China's Sichuan Province early Saturday that buried 62 homes and left more than 120 people missing. Fire fighters involved in the rescue operation said they had retrieved six bodies from the debris by Saturday evening. A total of 739 fire fighters with 133 rescue vehicles were working along with paramilitary officers and other professional rescue teams at the site. The landslide from a high part of a mountain in Tibetan and Qiang Autonomous Prefecture of Aba hit Xinmo Village in Maoxian County at about 6 a.m., blocking a 2-km section of river and burying 1,600 meters of road. The provincial government has launched the highest level of disaster relief response and sent rescue teams to the site. Currently, more than 1,000 workers with life-detection instruments are engaged in the search for survivors. The provincial department of land and resources said the landslide was caused by heavy rain. An estimated 18 million cubic meters of earth mass fell some 1,600 meters, engulfing Xinmo Village. Geological experts at the site said the chance of survival for the people buried was really slim. Only three people from one family were rescued five hours after the landslide struck. They were taken to Maoxian County People's Hospital and none suffered life-threatening injuries. Another child of the family remains buried. More than 110 villagers living nearby were being evacuated to township schools on Saturday night, fearing there might be rain and secondary disasters.